How to get there: The starting point is in the German (winter) resort town called Garmisch-Partenkirchen. This town can be reached easily from the Munich international airport via Autobahn A-95 (about 70 km) going south-west from Munich. We stayed in Gasthof Fraundorfer, Ludwigstrasse 24 (phone +49-88219270), this was very nice, however, the town has tons of places to stay. The roads leading into the valley Reintal are all closed to public traffic, thus the trailhead is really in the village itself. The official trailhead is located next to the Olympic Skistadium, however we started from the Olympic Icestadion, this is only a slight variation to the overall route. There is plenty of free parking near this stadion located at elevation 709 meter, location N47:29.229, E011:05.646. Route description: Note that this description starts from the "Eisstadion", a slight variation on the official trail that starts from the Skistadion located further east. The initial part of the trail from the Skistadion passes through a gorge, however this section was closed when we were there. The trail from the Eisstadion does involve a bit more vertical gain since some elevation gain is lost on a descent in Reintal. Overall, it does offer a very nice alternative to the official trail. The entire route may be done in a very long day by strong hikers, however to allocate 1.5 days is likely a better alternative. From the Eisstadion (Ice Stadion (skating)), head directly towards the nearest hill along a small, straight road that first crosses a railroad. At the end of this road you pick up trail P3 with signs for Partnachalm. This trail leads across a small hill called Kochelbergalm and climbs to 973 m, location N47:27.756, E011:07.102 at Partnachalm. You are now quite high above the Reintal valley floor. From Partnachalm, continue along the natural road that runs further along the hillside. The signs will now say Bockhütte. This forest road initially climbs a bit further, then has a rolling section with (small) uphills and downhills before it mainly descends further into the Reintal and eventually merges with the trail that initially followed the valley floor (from the Skistadium). Continue following signs for Bockhütte, finally, the road ends and a good trail continues up the valley. You are now near the valley floor, the river has dug a deep, narrow gorge at this point where the trail descends along steep cliffs. 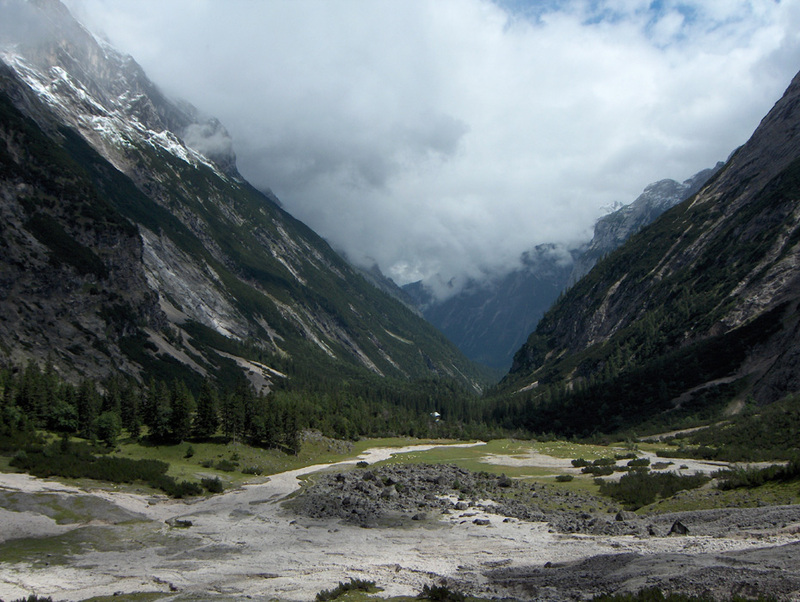 The trail is very pleasant as it crosses the river, then crosses back just before arriving at the Bockhütte. This hut is not a place to stay overnight, but it does have a nice selection of food and drink for sale to hungry/thirsty hikers. 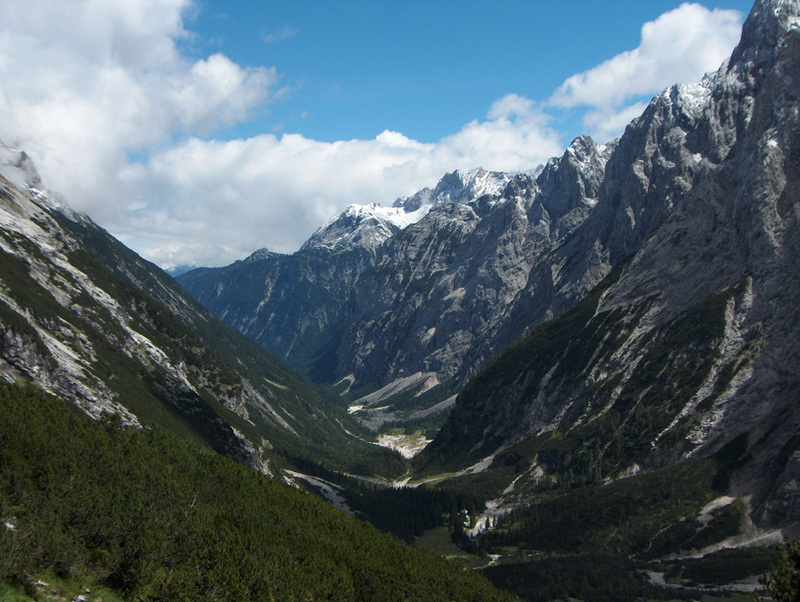 From the Bockhütte, continue along a nice trail up along the Reintal valley. Gradually, the trail climbs, more distinctly up on the right side of a nice waterfall. Shortly after the waterfall you arrive at the Reintalangerhütte. This is a nice hut that provides accommodation as well as meals (phone: +49-88212903). This hut is located at 1366 meter, N47:24.934, E011:01.970. From this hut the route continues across the river, then up and across an open field before ascending a small ridge (gravel) in order to traverse right and enter a distinct valley located above what can best be described as a step in the terrain. From this little valley, the trail forks right and zig-zag up the somewhat steeper slope in order to reach the Knorr hut at elevation 2051 meter, location N47:24.605, E011:00.775. This hut also offers meals and accommodation. 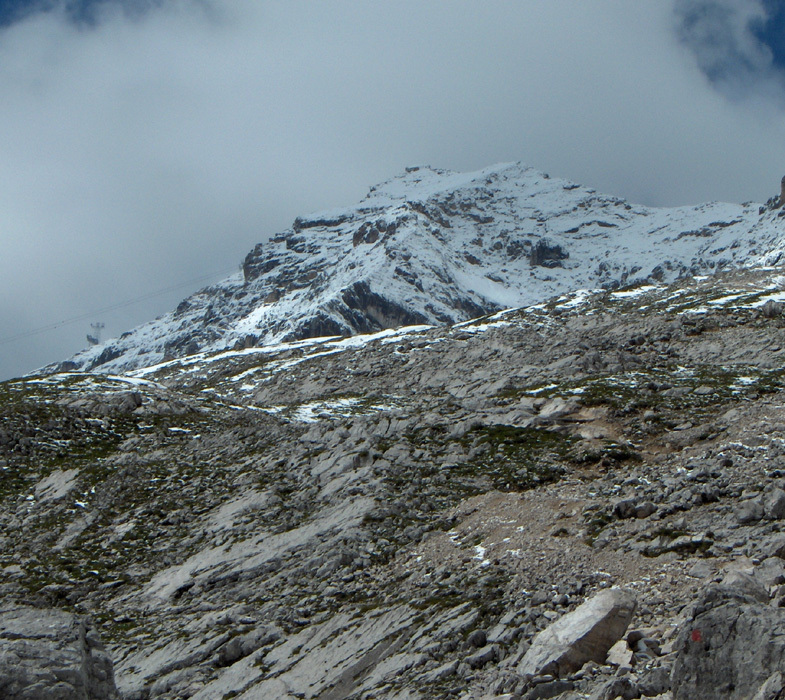 Shortly above the Knorr hut, Zugspitze finally comes into view on the horizon forward on your right hand side. The trail first continues up to a rather flat area near a station of one of the cable cars that provides service to the summit. Right ahead you will see two short ski lifts and a little up on the slope to your right is a rather large building that most likely also serves skiers in the winter season. To this point the trail has been mostly YDS class 1 with a few steeper sections that may be classed as YDS class 2. From here to the summit, the trail is somewhat steeper and largely secured with fixed cables. Unfortunately, everything was buried in deep (new!) snow when I did this hike, so what follows is a description based on the (very bad) conditions that we had. Under dry summer conditions the remaining part of the trail may possibly be just YDS class 2+ (with the cables). 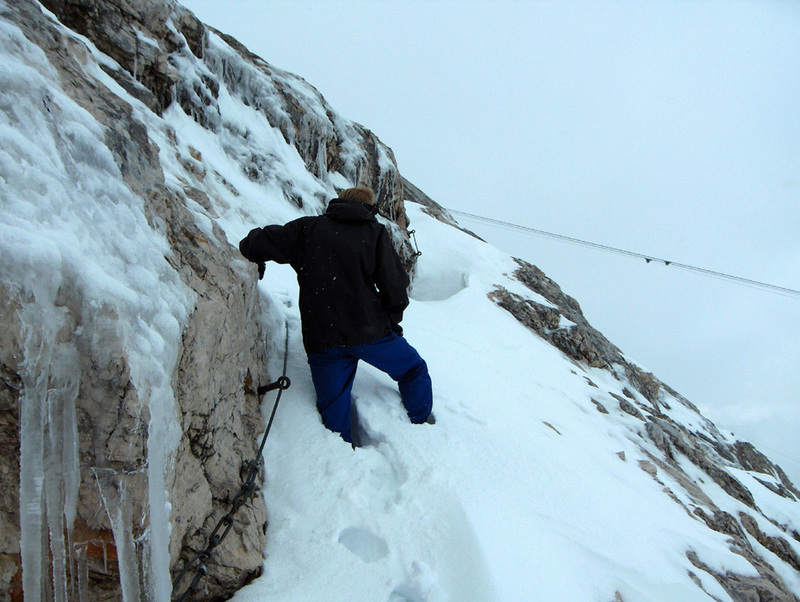 As a winter climb with ice and partially buried cables the climb is YDS class 3. Continue from the flat spot more or less directly under the wires for the cable way, diagonally up in the direction of the large building on the lower slope of the mountain. As you approach this building you will see the route as it is marked by the cables. The route traverses uphill away from the building (right), then climbs further with several zig-zag turns, largely following ledges and natural features in the rock. There are a few alternatives here and they are all of similar nature. Eventually, the route tops out on the main ridge and then follows this, sometimes a bit on the right hand side, to the summit. The Hoellental route, starting in Austria, merges in from the other side of the ridge (on your left) a short way before you get to the (not so nice) buildings on the summit. 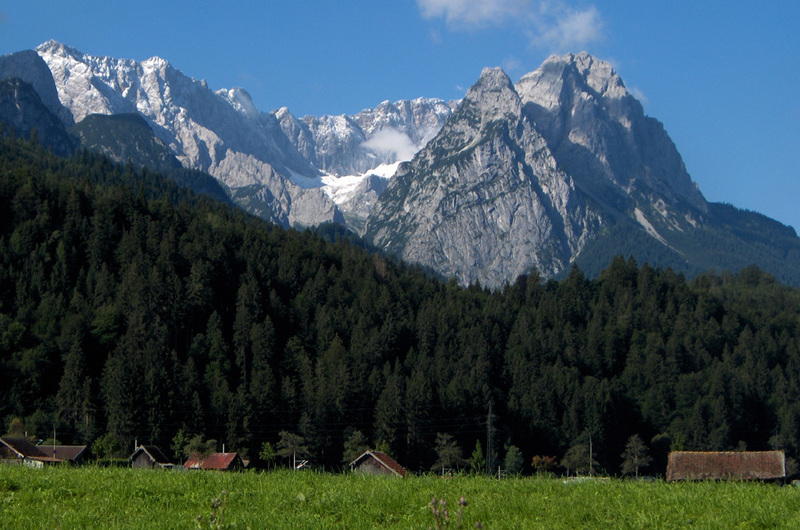 The summit of Zugspitze (highest point) is located opposite of the buildings as you arrive. 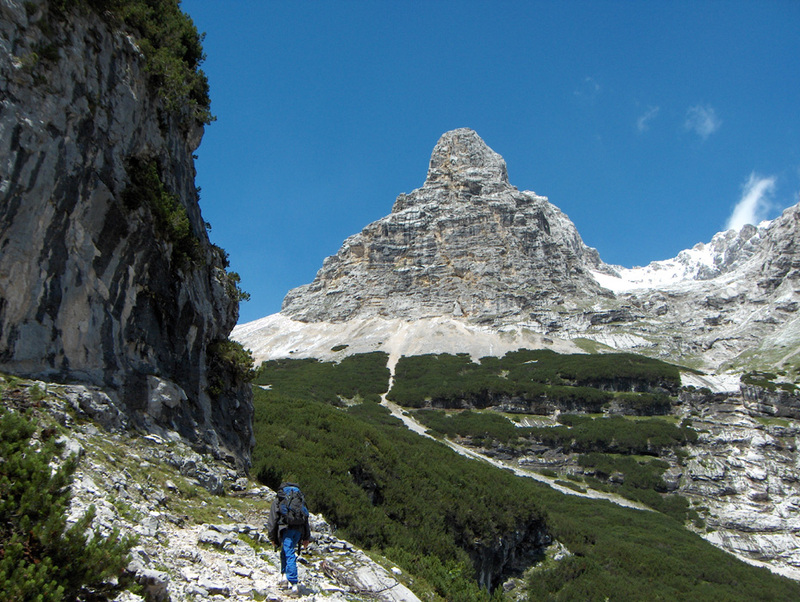 Traverse across and complete a very short scramble (with one short ladder) to reach the highest point in Germany. Comments: I did this climb with my son Pål Jørgen, age 16. We started from the Ice Stadium at 0900 and reached the Bockhütte after 2 hours at 1100. We took shelter for the rain and had lunch here until 1130. The continued hike, now without rain, got us to the Reintalangerhütte in another hour at 1230. We pushed on, but took a 15 minute break on the next slope, then reached the Knorr hut at 1400 where we again took a 30 minute break and enjoyed their good soup. Our hike resumed at 1430, we still had not seen Zugspitze and I realized that a single day roundtrip might be difficult to complete. However, we had a reservation at the highest hut in Austria (on Grossglockner) for the evening the next day, so better get this mountain in view fairly soon. 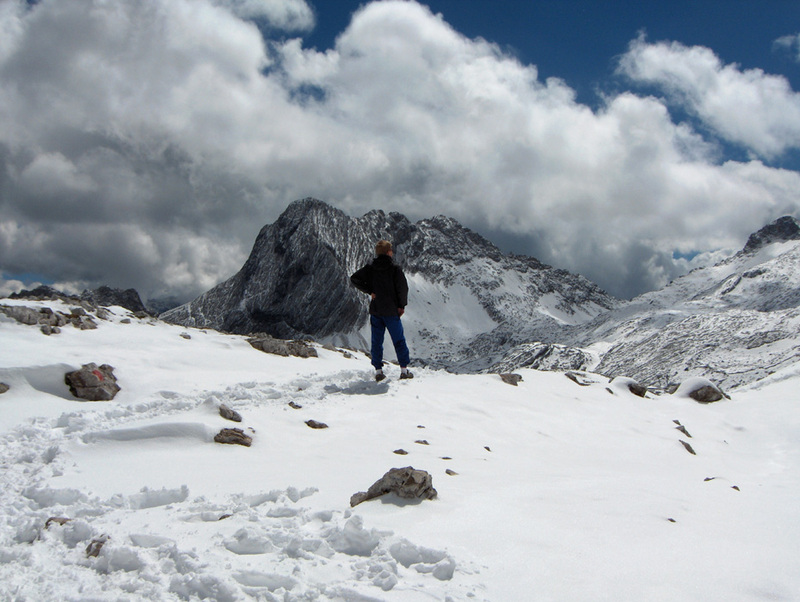 We quickly saw our target, but also a lot of snow, getting deeper for every step moving us higher. There were footsteps to follow, but alas, as we got to the cable car station, it became clear that these people had indeed taken a ride from here to the summit. There was not a single track or step leading from here and upwards. After pretty hard work in deep snow on an iced up mountain engulfed in fog, we finally arrived at the summit at 1715. The last tourists had been transported off the peak quit a bit before we arrived and only two "guardians" remained behind to prepare for a new day. They were definitely not pleased to see us climbing up on "their platform" in pretty bad weather. I headed straight for the true summit, there were signs saying that this section was "closed off", to tourists perhaps, but definitely not to the only two that had scaled this peak on foot today. We climbed under and over the barriers and proceeded to the true summit. I told Pål Jørgen that we should ask for some additional water and he replied: "first we must make friends with these two guys up here." It turned out that he had met them without my company and they had clearly expressed their anger to see climbers arrive at this time. Well, we stepped inside and they got a bit more friendly, supplied a mug of water, then looked on us with disbelief when I told them that we would soon start our descent. "Descent ! ", they exclaimed, "you are not going to descend now?" "Of course", I replied - "this is definitely not where we plan to spend the night." We left the summit at 1745, our tracks were still pretty good and the descent went swiftly and without any incident. 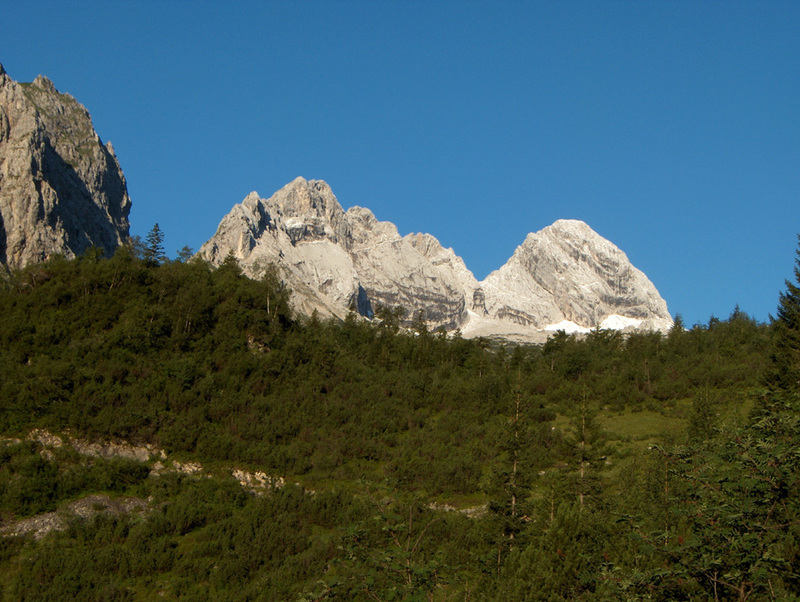 We reached the Knorr hut at 1915 and proceeded to Reintalangerhütte, arriving there at 2005. We decided that a good dinner and a night sleep followed by an early morning hike out would be a better scheme than arriving back in Garmisch around midnight and then very exhausted. Our stay in this hut was very pleasant, a good dinner followed by nice evening music and a couple of good tasting beers. We had an early morning breakfast the next day and departed at 0655, walking pretty fast we were back at the car in Garmisch-Partenkirchen already at 0925. Our E5 trip was now ready to move to its prime target Grossglockner, the highest peak in Austria. Turning into Reintal, this is quite early along the route. Looking back, still deep in Reintal. Pål Jørgen, starting to climb out of Reintal. Reintal, as we gain elevation. Into new snow that quickly got deeper. Iced up. 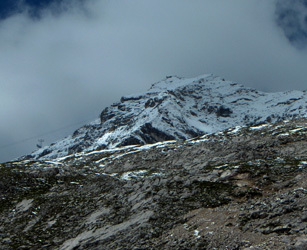 Zugspitze is icy and full of deep snow on its steeper slopes. 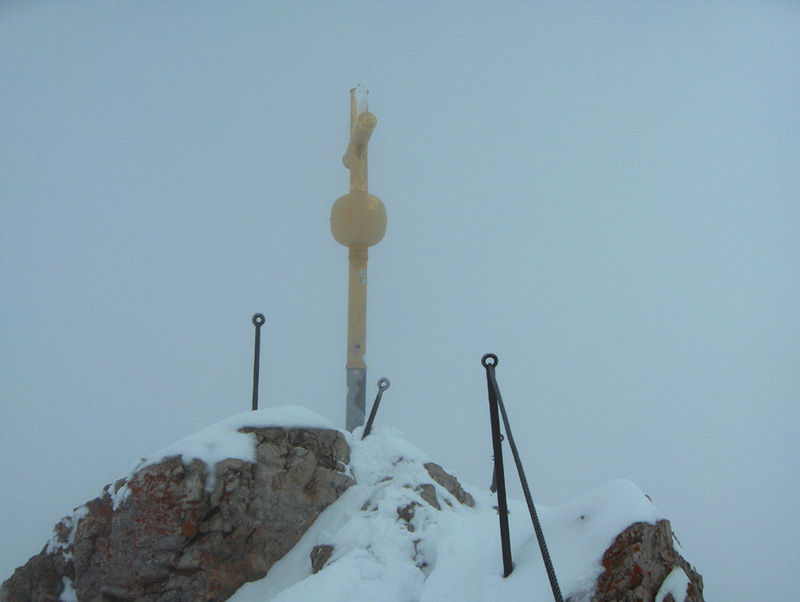 The Zugspitze summit. The time is 1715. Evening view from the slope of Zugspitze. 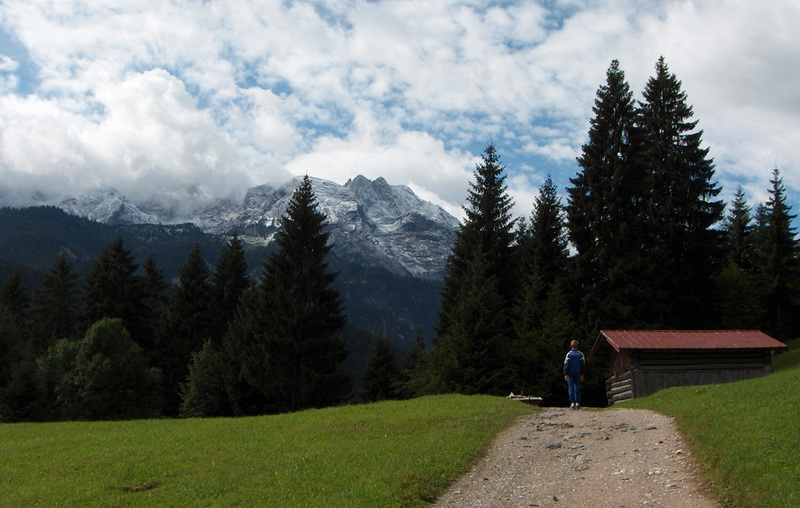 Garmich-Partenkirchen, as we return to the trailhead. Garmich, as it should be remembered.